They were a hit at our Holiday Party! I am the Chaplain Assistant in charge of care packages for the 1-169th. Thank you very much for the well designed personal cards. They were a hit at our Holiday Party! Thank you so much, they will be put to great use here! I found some of your cards that the previous unit had left. They are amazing. I love home made cards... thank you so much, they will be put to great use here! Thank you! I wanted to pass along a big thank you. I'm not sure how they arrived here, but I came across some very nice cards (which had the Operation Write Home sticker with your point of contact information on them). I'm currently in Kabul, Afghanistan as part of NATO's Internation Security Assistance Force. Anyway, the cards were perfect to send home to my wife, who is currently 7+ months pregnant. So she really appreciated the cute cards, especially during the holiday season. Very nice work and thank you very much. Thanks again for the great work you all do. I don't know SGT S. personally because she works in a different section over here, but I'll agree with her that when a box of your cards gets put out they don't usually last more than a few days! My wife really loves them, well because they're from me of course, but also because the cards are so nice! It's awesome the effort people put into them. Enjoy your vacation and have a wonderful Christmas!! I thought it would be a good idea to check in with you. The Christmas cards were fantastic. I sent some to my wife and family. The PX had slim pickings like I knew they would. My supply of other cards are dwindling here and there. What a blessing you have been to those who have part taken of your vision to supply the service members with greeting cards. I would reckon there is a threefold mission going on. You and your team love to make cards, then you send them to us for our enjoyment, and then our families, friends, and significant others get a one of a kind greeting card to cherish. You and your team are amazing. Thank you for your love and support! God bless you, your family, and team this holiday season. I just got a beautiful Christmas card from my brother who is stationed in Afghanistan. Thank you for all you do for the troops. The card is displayed above all the other ones at our home. God bless. I just wanted to say thank you so much for the card that you have sent to the company. I'm currently a single parent and have taken joy in writing my kids with variety of cards that you guys have sent to us. The cards are very well appreciated and used to keep loved ones in touch. Once again thank you and Merry Christmas! You guys are awesome! We had some cards left over from the previous unit. Everyone here loved them! And our families back home absolutely love receiving them! Thank you so much for your support. The cards are fantastic! You guys are the best! Thank you, thank you, thank you! **This came with a request for cards - this is a unit replacing one of our former contacts. Can't wait to set them out at work for all to go through! Just wanted to write you a quick note thanking you for the box of cards. I can't wait to set them out at work for all to go through! Everyone gets so excited. My scheduled return back to the states in mid-April, but could be pushed back if our replacements don't get here in time. I can keep you posted. Hope you have a wonderful holiday! Thank You for what you do for us troops and thank you to all of your card makers! We truly appreciate it! Thank you so much for the additional box of cards. I just received them today and me and another lady are going to give them out on Christmas day. Also, the AAFES Manger, E.K., will be here on Fenty for another two years. She is a wonderful lady who, through losing her husband in Iraq several years ago, her son in Iraq this past June, and both her parents this year, still has a bright and wonderful smile. 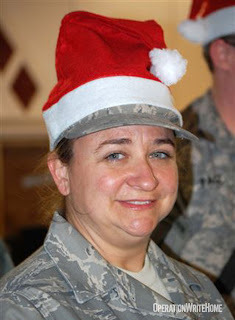 She loves supporting the troops and is a retired Major herself. She said she would be honored to distribute any cards you may like to send her. You can send them to her at the same address you have been sending them to me. The next box you send, we are going to get them to the soldiers that are down range in small camps, where they have virtually nothing. When we give the cards out on Christmas Day, we'll take pictures and share with your group so you can enjoy the joy the soldiers feel. This is my 4th and final deployment before I go home and prepare to retire. I will miss what I do here, and the soldiers that show huge appreciation for the little things we do for them. Again, thank you and your group and a special thanks to Gretta P*, who started this whole thing for Camp Fenty, Afghanistan. She's a sweetheart! *Greta is one of our cardmakers who requested cards for her friends! 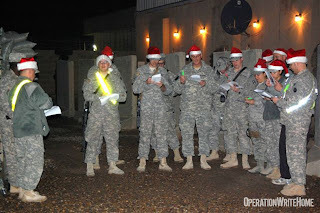 We went Christmas caroling to the different offices here on the FOB. Fun time, at one point made me miss home even more. I really appreciate all that you guys do, I have written probably 50 cards home to my wife and four kids over the past months with cards sent by OWH. The cards are always so perfect and sweet. I work in a building with about 300 other people and that's where I originally started finding your cards, I don't know who else is signed up but every once in a while a box of wonderful cards shows up and is put out for all to use. Haven't seen one in a while so I don't know if the person who was signed up has left or not, but I know lot's of folks here really enjoy writing home using the great cards you guys send. Thank you so much for the support and the great effort you all put into keeping us connected to our families. These days writing for most people is rare and these cards give a great opportunity for us to send a personal card home and that really makes our families feel so much closer. Everyone e-mails these days it seems, but how much more special it is to be filling up a hat box at home with such beautiful and personal cards! Thanks again, keep up the great support. Thank you again for those wonderful cards! Everyone was so excited to get another box full of beautiful cards. 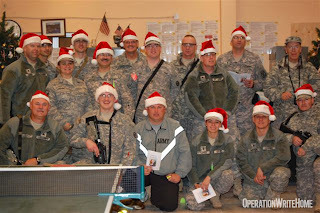 Your organization has made many soldiers and civilians happy and I am sure the recipients back home are happy as well! I love looking at the cards and think each and every one is beautiful! Looks like we will be home in January! We hope you have a happy and joyous holiday season… Looks like we will be home in January! Merry Christmas and Happy New Year! I just wanted to send you a little note letting you know how wonderful I think your program is. I am here in Qatar, in the lobby of the air passenger terminal waiting for a flight to Afghanistan, and I found a stack of your Christmas and holiday cards. They are gorgeous. You are truly providing our troops with a wonderful, thoughtful and sincere gift. Troops often go without while stationed in these remote locations, and it's people like you who bring a little piece of home to us. I sincerely appreciate your efforts and applaud you for your kindness. 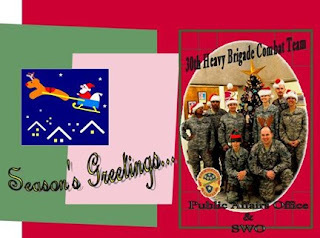 Thanks so much for sending the cards to our unit - especially with the holiday season here. Some of the guys in my unit thought the cards were so nice that they started writing everyone they could think of - including their wives who are always hoping for a letter in the mail. Happy Holidays to you and thanks for making ours and our families' holidays a little brighter. Thanks for the beautiful cards. I have sent out so many of them for the holidays. Keep up the great work! Just wanted to say thanks so much for all you do. I am a wife of a currently deployed sailor in Iraq. I just received a beautiful handmade Christmas card from my husband...it made my day! THANKS!!! I wanted to send you a personal thank you for your support of me and the 47th CSH. We will be heading home in Feb and will not be able to receive any mail after the 15. Anything received on that date or after will be returned to sender I am told. It has been truly a pleasure and a blessing emailing you. I want you to know from the bottom of my heart how much the cards have meant to me and other Soldiers. May GOD continue to bless you as you continue to be a blessing to others. I just wanted to drop your organization a line to say thank you. I received a card from my husband who is deployed in Afghanistan, and the card was from your group. Thank you so much for what you’re doing. Seeing his handwriting was a beautiful sight, and it means a great deal to those of us left back home to hold down the fort. Thanks so much for the cards!! I just have to fight the urge to go through and take all the one’s I selfishly want for myself!! I know the guys will love them and they’ll be put to good use. Our holiday season is as good as it can be considering; we’re having our combat Christmas Party on the 21st so that should be a good time. Thanksgiving was great, two of the DFACs had a traditional Thanksgiving meal, one for lunch and one for dinner. Other than the long line (about 45 minutes and NO PUMPKIN PIE) the food was pretty tasty. Thanks again for keeping us in your thoughts and prayers. May you have a safe and joyful holiday season! I wanted to say thank you so much for the huge box of beautiful cards that you mailed me! 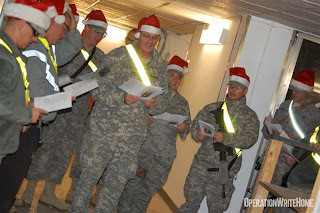 I was so excited to have such a wonderful gift to share with those deployed to Iraq with me. This is such a treat that both families and soldiers will enjoy. The soldiers had a great time picking out cards from the huge array. Thank you so much for all you do! It is much appreciated. I hope you have a great Christmas season! Thank you again! I was so surprised to receive your package full of homemade cards. They were the cutest cards I have ever seen. That is a great idea. Thank you so much for sending them. I put the box in our kitchen where soldiers and civilians gather to make coffee, etc. and almost all of the cards are gone. Perfect timing for the holidays. Again, thank you very much. 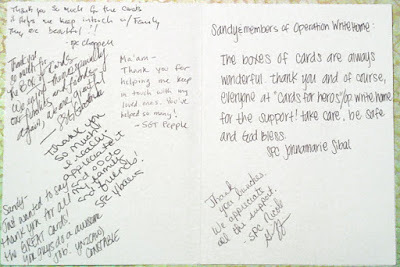 It was so fun looking at all of the different cards and sharing with our young soldiers and my co-workers. Our PX very rarely has cute cards, if any, so the idea of sending cards over here is amazing. Please pass my thanks on to all who made these adorable greeting cards. As you know i'm a soldier serving time here in Afghan and I wanted to say that I appreciate you all so much for the time you put into those cards. To be honest you can't find cards as nice as those in some stores. But the idea was wonderful and I like it so much that I been writing cards to so many different people. Once again me and the soldiers thank you all and want to ask you to continue to support us and keep us in your prayers. Oh yeah, have a joyful Christmas and a New Year of many Blessing!! My name is LCPL S. and I work with the chaplain and RP3 T. We received your package of cards and mail and want to say "THANK YOU!" It is such a morale booster for the troops to come in our chapel annex and pick up goods such as what you sent. What we do isn't always fun and items like these really help ease the times here. I pray God blesses you for your kindness and your holiday season is bright. Thanks again and take care! On behalf of everyone here at Camp Fenty, Jalalabad, Afghanistan, I send you a most heart warming thank you for all the cards! I think that has been the best present anyone here has gotten. I will be here until 8 March, but there is a lady here who works for AAFES that will be here until January 2011. She LOVED the cards and is an extremely gracious person. If you will continue to send the cards, I will be happy to ask her if she can receive and distribute them. It's so great to see the look on the soldiers faces and hear the excitement in their voices when they see that someone has actually 'spent time' on them. Again, thank you from all the soldiers and civilians that shared them. If you'd like to send more, I'll be more than happy to distribute them to the troops and I'll try to get pictures of everyone enjoying them and send them. This is from a unit that suffered great losses in a big battle you may have heard about on the news in October...we, too, remember those who gave the ultimate sacrifice! We sent them cards as soon as we heard of their new FOB location, so they could all write home to their families right away. On behalf of the Black Knight FRG, 3-61 Cavalry, we want to thank you for your generous donation. Your support provides great strength for our soldiers in Afghanistan and the families back home. October 3, 2009 is a day that we will never forget. The attack on Combat Outpost (COP) Keating and Observation Post (OP) Fritsche was a hard-fought battle and has changed the lives of so many of our soldiers and their families. We will always remember the lives of SGT Joshua Kirk, SGT Justin Gallegos, SGT Joshua Hardt, SPC Michael Scusa, SPC Christopher Griffin, SPC Stephan Mace, PFC Kevin Thomson, and SGT Vernon Martin. Their service to our country and their sacrifices will never be forgotten. Each soldier in Black Knight troop is a true American hero. As the soldiers were focused on surviving during more than 12 hours of intense combat, more than 70% of their buildings caught fire. As you know, many lost everything they had. Please know that your donations and quick response helped our soldiers get back on their feet quickly. They are strong soldiers who have become closer through this very challenging time. Your support has given all the families back home peace of mind that their soldiers are being very well taken care of. We appreciate your kindness and generosity. Thank you for your patriotism and support to Black Knight Troop, 3-61 CAV. As a recipient of the beautiful cards made by your organization I would just like to relay to your contributors my deepest and sincerest gratitude for the work you do. I cannot tell you how much receiving these cards from my loved one means to me and helps me get through this difficult time apart. Thank you from the bottom of my heart.